To be able to enjoy and appreciate music, is one of life's truly great gifts. Engaging with music is something people can do and take happiness from throughout their life. Very often, a person will develop this love early in their youth. The influence may come from their families and communities but it can also come from their schools and teachers. By bringing music in to the classroom, you as a teacher, have the chance to influence not only a child's relationship with music but with art and creativity which can impact them in all sorts of ways. For many teachers, music can be a daunting subject particularly if you have never felt particularly confident with your own ability. This is why we have produced this guide to help you structure and better understand the best approach to teaching music in the classroom so that both you and the children will be able to enjoy the lessons. At the end of each section, you'll also see links to relevant blog articles we've written on each of the topics for further reading. As a subject, music is unique in its range and scope across the three domains of learning: cognitive, affective and psychomotor. It has been proven to benefit cross curricular learning, particularly with literacy. Most importantly, music is something that all students will be surrounded by for the rest of their lives. The goal of music education is to encourage children to appreciate and enjoy the hugely positive benefits that music can have on their lives and their relationship with the world around them. Children of all ages have the potential to develop self esteem and creativity as individuals as part of a profound shared experience that fosters empathy, communication and collaboration. The curriculum goes on to express how for an individual it has the power to promote self esteem, mental wellbeing, creative thinking, problem solving and a joy of learning, which make it a hugely beneficial subject for primary school children. It also recognises that as a group activity it is a way to create special shared experiences, encouraging collaboration, understanding and empathy. Each year group is divided into the three core strands of listening and responding, performance and composition (which we will come on to). Each year gets progressively more complex within each of these strands while still retaining the continuity from year to year. The teacher guidelines accompanies the curriculum and gives a thorough overview as to the planning, delivery and assessment components of all sections covered in the curriculum. Sample our full music curriculum with 6 weeks of lessons and resources to try with your class! Learn all about traditional Irish music, the tunes, the instruments and the history! The three main strands of the curriculum are as follows: listening and responding, performance and composition. Each of these strands are interrelated and are ordered accordingly. By listening to an existing performance or recording of a piece of music it provides an essential grounding prior to any performance of that music. Once a child has listened and performed a particular style of music, this can then help inform and inspire the composition of their own new music. The resources we use in DabbledooMusic are divided into these three strands. Through the listening and responding strand, the children are encouraged to explore a wide variety of different sounds. These include everything from the sounds we hear in nature to basic percussion and melody instruments. An important part of this section is for children to be exposed to lots of different genres of music with a particular emphasis being placed on Irish traditional music. There is also a focus on the importance of moving to music which includes dancing or simply clapping along. To achieve the delivery of this strand, recorded music whether through CD or an online streaming or video website is great, however if there is an opportunity for children to experience live music, this is even better! Through the performance strand, the importance of active music making is emphasised firstly by using the voice and then by using instruments. Children should be able to perform music without having to read music. This means that while musical literacy is important and beneficial, particularly in the earlier years, it is not a requirement. The children should also be encouraged to perform in different settings; both as an individual and as part of a group within the class. Again this can be achieved firstly, by using the voice through song-singing and then by introducing melodic and percussive instruments. You can even try combining the two together. Exploring ways of varying performances through dynamics, tempo, instrumentation etc. is also encouraged. Finally, through the composition strand, a child will be able to develop their creative abilities even further. Here a child get's to make the decisions on the direction and form of the music they want to produce. They'll have to decide everything from the rhythm and melody to the instruments they want to use in their piece. The more the children practice their composition skills the greater confidence they will have to add in additional elements and complexities. The listening and performing of relevant pieces will also help to inspire the composition process. Graphic notation, invented notation, simplified notation or standard notation may be used to record ideas, in addition to electronic recording. The musical concepts, as prescribed in the curriculum, are the same for all ages. These are laid out fully in the schemes of work for each class group and include things like rhythm, pitch and duration. The development of the students through each year is assessed by their progress in understanding and implementation of these musical concepts. - An infant class would be encouraged to listen to a march rhythm and clap or march in time. - A first or second class would use instruments to play this march rhythm and display confidence in keeping time. - A third or fourth class would develop the idea of weak and strong beat in a march ( 1 2 3 4 ), and play with increased confidence and awareness of weak and strong beats. - Fifth and sixth class students would show confidence in performing and identifying music in 4 time and using weak and strong beats in performance and composition. - Performing at a steady pulse or beat. - Exploring long and short sounds. - Understand and differentiate between fast and slow. - Understand and differentiate between high and low sounds. - Understand and differentiate between loud and soft sounds. - Understand ‘start’ and ‘stop’ in terms of group performance. - Play with and explore a variety of sound-making materials. - Classify sounds by the way they are produced. - Listen and respond to sounds from one source and from more than one source. - Listen and respond to music in different styles. Through each year level, the teacher will build on the listening and responding, performing and composing activities of the previous year, with each of these musical elements in mind. As an introduction to music, singing is a great first step for kids. Many will have come to school already having sung nursery rhymes at home but as part of their music curriculum in school, you can help them improve their voices and also develop their love for singing. 1. Warm-up your class - this helps make sure the children don't strain their voices and can be done through some very simple humming exercises. 2. Call and response - the teacher can start off by singing a note and the class can repeat it back. This can then be extended in to more simple and then more elaborate sequences of notes. 3. Song-singing - once the children are comfortable and you have picked appropriate songs for them, you can work on getting them singing complete pieces. For more advanced classes, you can also look to introduce harmony singing in the classroom. To get full details of our recommendations when it comes to singing in the classroom, click on our blog article below. This article also includes our tips for ways to build up a teacher's confidence with their own ability to sing. - Avoid using loud instruments - a full class of children all with instruments is going to be loud so it's best to try and avoid using particularly loud instruments such as symbols. - Divide the class into smaller groups - by splitting the group up and giving each one a separate instrument, the children will be able to easily follow along with their part to play. We recommend dividing the class into 4 groups. - Use different sounding instruments - try to use different sounding instruments with the class so that it creates a nice blend of different and interesting sounds when they perform together. Here are four instrument types we regularly use in our workshops with groups. When the class become proficient with playing the instruments in their groups, you can start coming up with new rhythms for them to play as well as getting them to sing and play together. For more recommendations and tips for using instruments in the classroom, click on our blog article below. What instruments can you use in the classroom? - Choose appropriate music - select music that is accessible for children to understand and appropriate for their age group. 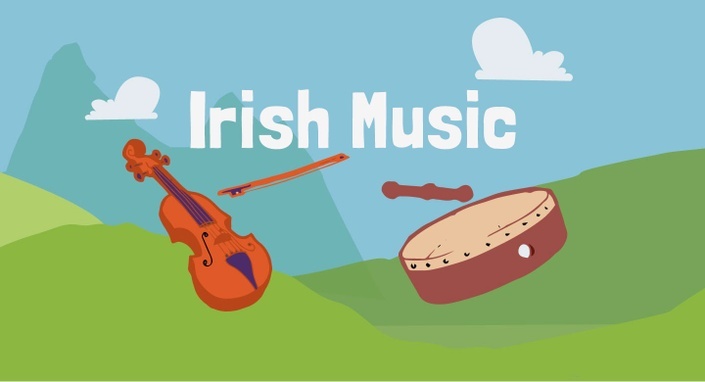 - Listen to Irish music - children should develop an appreciation for the rich culture and history of Irish music and the wide variety of instruments, songs and dances within it. - Listen to music of other cultures - this can include learning songs, dances and occasions that music is played at in other cultures. - Talking about the music - discussing with the class how particular music sounds or makes you feel. - Describing music in other forms - such as drawing or writing. - Song-singing - make sure to choose a song that the children will enjoy and that is in a good range for them to sing it. Find a recording or way of performing the song for the class before they start. - Playing untuned instruments - consider the amount of instruments available. Also consider the quality and state those instruments are in. - Playing tuned instruments - these can include the recorder, tin whistle, ukulele or chime bars. - Being aware of musical elements - these include the tempo, the pulse, rhythm and melody and should be applied to both song-singing and instrumental performances. - Identify opportunities or purposes for composing - examples include: adding music to a poem or story, experimenting with sound or composing to represent a mood or atmosphere. - Setting the parameters for the composition session - decide whether it will be done by each individual or in a small group and decide whether the children will use instruments or vocal sounds. The final thing to consider is the teacher's role in being able to lead all of these activities. This includes being able to explain and explore the relevant musical concepts with the class during each of the lessons. - Recorded music - use CD, video or online streaming websites to access music recordings. - Available instruments - try to obtain different types of tuned and un-tuned instruments for group performances in the classroom. - A child in the class who plays an instrument - encourage the child to bring in the instrument to demonstrate it and, if possible, play along or accompany the class during a performance. - Musician within the school community - if there is a member of staff or a parent who is a proficient musician, this can be a great opportunity for a live performance in the classroom. - Working with local music groups - if there is a local music school, band or community choir, there may be an opportunity to invite them to the school for a performance. - Technology in the classroom - these can include using online resources via an interactive whiteboard, speakers and recording devices. The value assessment can have in music is being able to point out areas a class or individual can improve to help them with their overall skills and enjoyment of music. It is also important so that the children are adequately prepared as they move from year to year. - Teacher observation - assess the development through performance, composition and group discussions. - Teacher designed tasks and tests - these could involve performances with instruments or the voice or could be based on the task of composing within a specific theme. - Questioning the class - this helps assess musical concept development and identify weak or strong areas within each lesson. - Collaborative learning - assessment can be made through the response to group exercises and activities. 1. Listen to more music - listen to music on your commute into work or when you're cooking your dinner; the more you surround yourself with it, the more natural it will come to you. 2. Get singing - sing in the shower, whistle as you walk down the street or do it through a more organised activity such as joining a choir. Changing your mindset from 'I can't sing' to 'I'm going to improve my singing' can be all it takes. 3. Learn a new instrument - there's a multitude of options for learning an instrument from free online video tutorials to local music schools. Always remember, you're never too old to take up an instrument. 4. Compose - why not try writing lyrics and then put music to it. You could do it for a friend's birthday or anniversary. It doesn't matter how good it is, the process of doing it is the most important. 5. Training on the Irish Primary Music Curriculum - this could be through asking a friend or a colleague to help you with it, attending a CPD course, going through the curriculum teaching guidelines or finding resources which will help you with it (like the resources you can subscribe to on our blog). The good news is that children find making music easy. They are not afraid to make mistakes or take risks with music. This is what makes it a hugely beneficial subject for exploring their creativity and gaining confidence and self esteem. If you're struggling with delivering music in the classroom - you can always find ways to break down the activities to make it easier. There's many ways to teach music and as long as you and your class are enjoying it, that's the most important thing of all! At DabbledooMusic, we have designed resources to help you encourage this creativity while providing a structure around musical activities in the classroom that will make it fun for you too. Our curriculum content is designed to make music fun and accessible for all teachers with detailed planning sections and weekly lessons. If you would like to find out more about how our resources work, sign-up to one of free courses and try it out today!